Kola's Belzec report and photographs [?] of core samples. I understand some posters here have copies of Kola's report on Belzec. The technique used was to drill core samples about 65 mm in diameter. As I understand this technique this results in long columns of soil and/or rock. As an aside does the technique of core drilling allow the core to be re-inserted? In most cases I doubt there is a need for it, but for reasons of sensitivity it might considered appropriate for Belzec. Or were the samples just taken away and disposed of somewhere? However, my real interest is that Kola describes the columns as containing charcoal, body remains and saponified fat etc. Are these results presented in the form of photographs or simply hand drawn diagrams? If photographs would it be possible to scan one of the mass graves cores to see what they actually looked like? The claimed core samples are hand drawn. That's correct, no photos. Why no photos? We must also ask how Kola could have taken core samples when the area he would have sampled looks like this. David Irving described the area, which supposedly covers the alleged mass graves (how convenient), as an 'impenetrable lava field'. I don't have the book with me right now, but if I recall correctly the samples were supposedly put back in the holes. Hannover wrote: We must also ask how Kola could have taken core samples when the area he would have sampled looks like this. The bizarre stone monument thingies were installed soon after the Kola drillings/excavations. Remember, the official reason for Kola's work was to "exactly locate the mass graves" (as if their existence had been a verified fact since previously) before preparing the new monument. A core drill would be able to drill though that lava layer, they drill through rock quite happily in geological surveys. But it hadn't been constructed when Kola did his work, if he did do his work. I don't know much about the technology of core drilling but I am surprised that there is "re-insert" functionality. On the other hand I certainly don't know enough about it to say there isn't. doesn't look like core drilling technology capable of extracting 6 meter deep core samples or re-inserting them. "Positive data and negative findings were recorded before replacing the soil samples in the boreholes." On the other hand, the Kola Report contains a heap of photos of dug up trash, such as this of rusty old horse shoes. That metal rod isn't going to be doing that. Never seen or used core drilling technology but that doesn't look like it. Look at these guys, it's all so absurd. It doesn't even look like the area where the alleged mass graves are supposed to be ... see photo #2. Why do they refuse to do a legitimate excavation showing photos and layers in cross sections? Actually, we know why. As mentioned above, the massive "monument"/covering of the mass grave area with an artifical lava field is post-Kola. 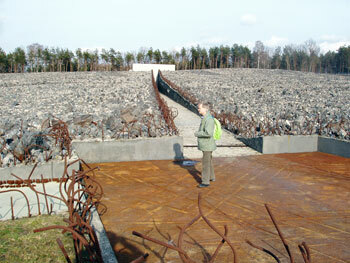 The alleged mass graves are under the "lava" monument. The probings were officially done in order to dig the tunnel like pathway seen in the #2 photo without "disturbing the graves". Laurentz Dahl wrote: As mentioned above, the massive "monument"/covering of the mass grave area with an artifical lava field is post-Kola. Yes, I realize that, but look where they are. These guys are practically in the woods, if they're even at Belzec. Without "disturbing the graves" is a transparent excuse for the fact that they don't exist as alleged. There are woods just east of the Belzec site, and there was a lot of underbrush/small trees vegetation such as the one seen in the photo at the camp site proper prior to the building of the new monument, as can be seen in video clips over at ARC as well as in some of the photos taken at Belzec by Mattogno. As pointed out by Mr. Phillips however, the manual drill seen in the photo above would not give the 6.5 cm samples as stated, but rather 1-2 cm ones. How do we know these men are even at Belzec? In legitimate excavations there is constant use of confirmation. Kola's alleged samples (hand drawn) are lacking even the most basic verification principles. That is the hallmark of fraud. Kola says two diameters of rods were used. One a "narrow gauge" and one "wide gauge". The wide gauge means a solid rod to probe for structures. That's the one we see the two guys using. The narrow gauge would be a 2.5 inch tube to take core samples. Not shown anywhere in Kola's book. The two guys pawing the rod is the only photographic 'evidence' in Kola's book to show any procedure for the alleged investigation. Two other guys with shovels could and would show in a matter of a couple of hours there are no remains below. Underneath the rocks now laid over the entire field there is in fact a heavy tough 'geotextile matting' used to support road beds on iffy terrain. They say it's to prevent remains from working their way up from below. Obviously an attempt at warding off any stealth investigations. It takes big measures to cover up the big lie. The only thing below it all is the same thing that's been there since glacial age deposits created the hill. If there were any remains found it would be those of some Neanderthal. The wide gauge means a solid rod to probe for .structures. That's the one we see the two guys using. Is it possible it is the other way around. The narrow gauge being used to probe for structures and the thick gauge being used for core sampling? (Thick gauge being needed to form the core to pull up). As a guide 2.5 inches is about three fingers width or a greater width than the inside of a toilet roll. That rod in the picture looks thinner. But you would still be correct that the actual core sampling device is not photographed but just the probing rod (yes, I should get around to reading that report). TMoran wrote: If there were any remains found it would be those of some Neanderthal. 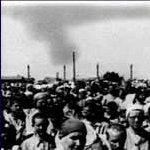 First, there was a labor camp on the spot during 1940-1, as well as a transit camp for gypsies. We know that the conditions in this camp was hard and that it was plagued by epidemics, so hundreds if not thousands of inmates would have died during those years. Most likely, they were buried on the spot, probably after being partly or wholly cremated to prevent further spread of epidemics and contamination of ground water. So there should be human remains at Belzec. The question is to the amount. What should be done is to have an impartial research commission of experts locate and open the graves and then measure the mass of the human remains found, as well as re-excavate the area of the supposed "death camp".